During the cooler months, nothing beats the blues like a warm cup of Tea. While the custom of drinking tea dates back to the third millennium BC in Asia, it was not until the mid 19th century that the concept of ‘afternoon tea’ first appeared. In 1840, afternoon tea was introduced in England by Anna, the seventh Duchess of Bedford. The Duchess would become hungry around four o’clock in the afternoon. The evening meal in her household was served at eight o’clock, leaving a long period of time between lunch and dinner. The Duchess asked that a tray of tea, bread and butter, and cake be brought to her room during the late afternoon. This became a habit of hers and she began inviting friends to join her. As this became a fashionable social event, during the 1880’s, upper-class and society women would change into long gowns, gloves and hats for their afternoon tea which was usually served in the drawing room between four and five o’clock. Traditional afternoon tea consists of a selection of dainty sandwiches including thinly sliced cucumber sandwiches, scones served with clotted cream and preserves, cakes, and pastries. Tea is poured from silver tea pots into delicate bone china cups. One day, I would love to experience afternoon tea in London…but for now the east coast of the U.S. will have to make do. For our most recent tea experience we visited the Ritz Carlton. Afternoon tea at the Ritz is served at various times of the day, our reservation was at 4 o’clock. We were seated in a room with several large parties. I found the room to be quite noisy and asked to be moved to another table. Tea is quite popular for bridal parties and afternoons out with the girls. Once we were seated at a quieter table, we were presented with menus. We were served a plate of lovely tea sandwiches consisting of smoked salmon on pumpernickel bread, an egg sandwich with deviled caviar, smoked chicken and cranberry salad, cucumber with whipped feta cheese, and green pea hummus on marble rye bread. The tea menu was quite expansive. I chose “the champagne of tea”, a smooth tasting darjeeling tea. After our sandwiches were served, we were presented with a tiered plate of sweets consisting of current scones, chocolate covered strawberries, chocolate hazelnut tortes, tiramisu mousse, lemon berry tarts, and cinnamon palmiers. A strawberry and whipped cream delight! It was heavenly. We had planned to stay for dinner after tea, but between the sandwiches, sweets, tea, and whipped strawberry treat, that was enough food to satisfy us for the evening. I’ve had my eye on this Kate Spade tea kettle HERE for a while, what do you think? I also love this one in red HERE. The lobby area with fresh flowers and an oversized chandalier is quite beautiful. in glass vases thoughout the Ritz. All in all, a great experience. 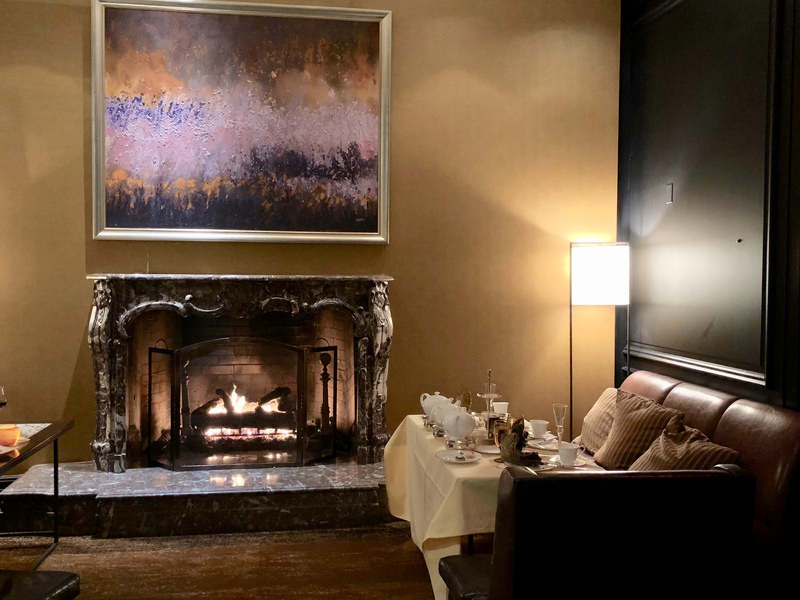 Afternoon Tea is offered in several rooms of the restaurant, this setting in front of the fireplace looks to be the most coveted in my opinion. For more tea experiences, you can read about our visit to the Nemacolin Tea Lounge HERE. Sign up to receive Happy Haute Home posts delivered right to your inbox by subscribing. Such a cozy and serene space, I would love to visit and get a break from all the elements for a few hours next time i’m in the vicinity, thanks for sharing. Thank You Sammy! I hope you get an opportunity to have Afternoon Tea in a setting such as the Ritz, it is truly a great experience. I love MacKenzie-Childs too! The checkered black and white pattern is so beautiful! But yes, can definitely see how afternoon tea could put on some pounds. What a fabulous time you must have had living in England!! !